Queen’s South Africa officially impressed naming to: 60912 Gnr. H. Howard, Q.B., R.H.A. 1914-15 Star officiallt named to: 23332 Gnr. H. Howard, R.F.A. 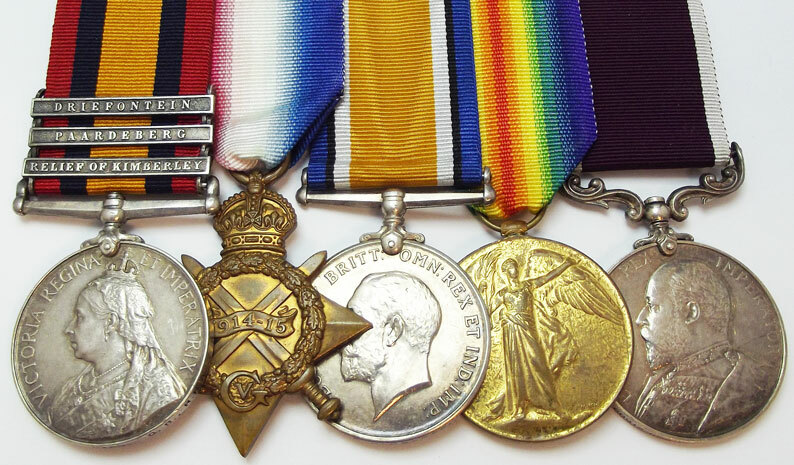 British War and Victory Medals officially named to: 23332 Gnr. H. Howard, R.A.
Army L.S. & G.C., E.VII.R. officially named to: 60912 Gnr. H. Howard, R.F.A. 20 Plus pages of service history showing lingering mental and physical effects of his wounds. A true hero. Gunner Howard was wounded at Sannah’s Post on 31 March 1900, when “Q” Battery won four Victoria Crosses. The Battery saw service in the Boer war between 1899 and 1901. On 31 March 1900 the Battery had its finest hour when it saved its guns and the majority of General Broadwater's force from a vicious Boer ambush at Koorn Spruit, near Sanna's Post. As the Battery galloped away to the rear in line, the Boers, seeing that part of their prey was escaping, opened fire with rifles from the edge of the Spruit. Q Battery's guns were severed for four hours in that exposed position, subjected all the time to continuous rifle fire at 1,000 yards range - it must be remembered that at the time the guns had no shields! 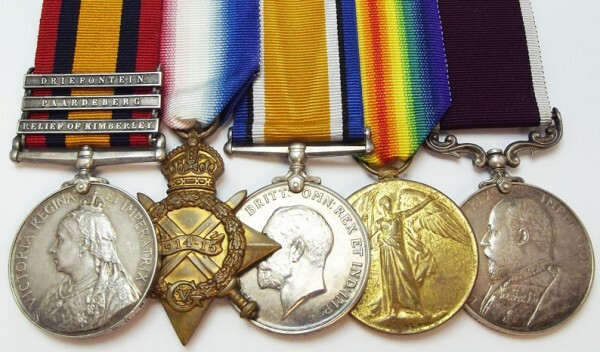 The Battery fought with such collective gallantry and skill that Field Marshal Lord Roberts VC, directed that 4 Victoria Crosses should be awarded to the Battery, one to an officer, one to an NCO, one to a Gunner & one to a Driver. It is the most highly decorated action in the history of the Royal Regiment of Artillery. In addition 3 Distinguished Conduct Medals were also awarded. In 1926 the Battery was granted the honour title "Sanna's Post". In conclusion I am glad to say that on this, as on other occasions, the troops behaved in a most gallant manner, and I cordially support Brigadier-General Broad wood's recommendations on behalf of the Officers, non-commissioned officers and men whose names he has brought to notice. ROBERTS, Field-Marshal, Commanding-in-Chief, South Africa.